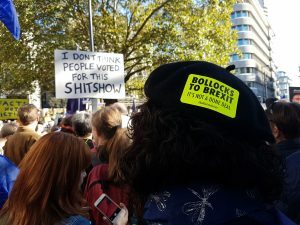 Those who believe that leaving the European Union is a huge mistake were understandably overjoyed at the vast turnout to march for a second referendum on 20th October 2018. The theme of the march, quite rightly, was the coming together of those of different party politics to put the young first. The march itself was heavily populated by young protestors. When Theresa May said that she was calling the 2017 election she referred to the fact that the country had come together but Westminster had not. She could not have been further from the truth. Indeed, since that time the country has become progressively more divided. Gradually the size of the marches has increased culminating in what would appear to be without contest the second biggest protest ever on the streets of London. In the meantime the opposition has failed to mount any meaningful challenge to the policy of leaving the European Union. The opportunity to oppose was there but the leader of the opposition has seen fit to impose three line whips on pro-European Labour MP’s to allow the parliamentary business of Brexit to pass unopposed. He has also singularly failed to bring the government to account in successive Prime Minister’s Question Time sessions. His silence belies May’s earlier view. Some say that she could not have had an easier ride. The “meaningful vote” looks like it will be a sham in terms of its timing and scope. By the time of the vote will the country be looking at crashing out with no withdrawal agreement? Will fear sell whatever agreement May manages to get through to Parliament? 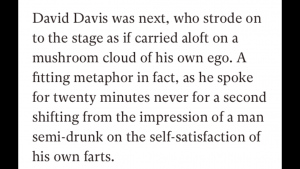 Corbyn looks like a conduit for it based upon his past performance. It appears that even some MP’s simply do not understand the difference between a withdrawal agreement and a trade deal. The crucial significance is that whilst the Brexit backers cite the 29th March 2019 as the end, it is in fact just the beginning. The public continues to labour under the misapprehension that “a deal” before that date means an end, freedom from tyranny and a glorious return to the days of empire. Sir Ivan Rodgers told Theresa May not to trigger Article 50 for very good reason. She, however, was still basking in the Conservative Party September 2016 Conference which Brexit supporters had managed to turn into a drum-banging sea of red, white and blue. Better times back then, it seems, for the former Tate & Lyle enforcer. May even saw her vision of Brexit in those hues. Not just any old Brexit. But green did not feature in that particular Brexit vision. Rodgers knew his onions but any half-decent estate agent would know where the problem with May’s position lay. Article 50 was never intended to be used as it was. Its primary purpose was to allow for the orderly withdrawal of states which had become “rogue”. It had never really been envisaged that a member state would be willing or desirous of destroying its position within a 500 million + trading block. The richest one on the planet. May would have been well-advised to consider green along with her red, white and blue Brexit. For the issue of the Irish border is not going away. Despite the insistence by some that its conundrum is soluble through technology. Is it a pebble placed as a stumbling block on the path to the cliff-edge by pro-Europeans or a natural inhibitor for which there is no engineering solution? In its simplest form the United Kingdom shares a land border with the European Union. Some (including European Research Group MP’s) will point to cameras along Flughafenstrasse in Basel where Switzerland joins France as evidence that this is a false hurdle to Brexit. Try looking at Flughafentrasse on Google Earth. It is a local access road. Near it is the A35 dual carriageway. The Route Douanière leads on to Flughafenstrasse. Underneath on the A35 there is something to see which very much looks like a hard border. After all, there’s a hard border between Norway and Sweden, between Montenegro and Croatia. It is an obligation as a Member State to protect the Union with a hard border, for reasons which are obvious at every level. Domestically, May is stuck between the DUP and the rock of the Myth of Sisyphus. The dangerous and unyielding rock which gets heavier as you push it to the top of the hill and comes rolling down, time after time. Sounds like she needs the backstop to the backstop. With Johnson piggy-backed upon her, the poor woman must be exhausted. On 29th October a meeting named “Brexit SOS” took place at the Great Northern Hotel in Peterborough. 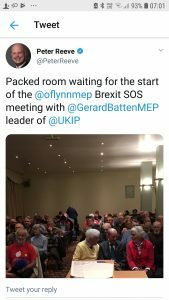 Gerard Batten (he’s the latest UKIP leader, by the way) gave a speech to what was termed to be a “packed room” and shared it on social media. It is self-explanatory, as is the presence of 700,000 on the streets of London, protesting with vigour, humour, decency and energy that 46 years of European life is about to be denied them. Tasteless though it is to stereotype and dwell on mortality there is no doubting the fact that there was a very definitive age split in voting preferences at the referendum. This is simply not going to go away. As much as May pushes the rock the more tired she will become and the heavier the rock will get. The division between generations is an inexcusable outcome of a politician’s attempt to gamble the national interest. It is a blight to the younger generations of the nation watching and living in the shadow of May’s attempts to get the rock over the top. She should give up; and so should those resisting the marchers on 20th October 2018. Their energies and experience can be better utilised elsewhere. Not in some futile phoney war for blue passports and the return of sovereignty which had never been lost. Not in championing a democracy that allows hereditary peerage over a European Commission which is elected by mandated MEP’s. Or a“first past the post” primary electoral mandating prescription over proportional representation. A false war of empire versus neighbour stirred up by manipulative generals. As lost Japanese soldiers in the jungle imagining to continue to fight a campaign which they thought to still be waging years after its end, so their war should be brought to a peaceful end in the most dignified way possible. 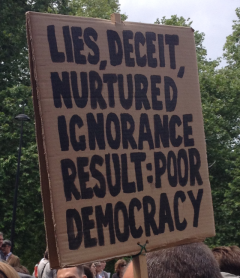 The People’s Vote may be the only way to put some of the miserable and frightening escapees from Pandora’s Box aside. Many older voters who turned the key to the box should reflect carefully with the much-vaunted decency and fairness of their generation before taking part in the exercise to exorcise.